Although it is an appealing investment, a McDonald’s franchise can’t be taken lightly. The brand is always seeking ambitious and proactive minds that are keen to make a long-term commitment to the business. McDonald’s is looking for hard-working and dedicated business people that are willing to immerse themselves into the franchise. There is a rigorous selection process to ensure the right people are chosen for the job. The Northern Franchise Exhibition on 21 & 22 June at the EventCity, Manchester. We’re always looking for hands-on, ambitious people who are ready to make a long-term commitment to our business. As a franchisee, you’ll need to make a significant up-front financial investment, which means having at least £100,000 in unencumbered funds. You’ll also be ready to lead from the front and work within our framework to give yourself the greatest chance of success. Meet three of our newest franchisees, click here. *Based on 80% of the restaurants franchised from October 2017 – October 2018. The monthly rent payable by 80% of restaurants franchised in 2018 ranged between 12.25% and 21% of that restaurant’s net sales. Typically this rent is fixed for 20 years on the initial term. Rent is calculated over a 10 year period factoring projected sales and projected profitability. There is an additional monthly service fee of 5% of the net sales for the use of the McDonald’s system as well as a contribution to the marketing fund which is currently set at 4.5% of net sales. When it comes to training and support, our franchisees receive some of the best in the industry. That’s because we believe that our success starts with yours. So you can look forward to support from a Franchisee Consultant as soon as you start your training programme. They’ll help you to optimise sales and profitability while keeping quality, service and cleanliness standards high. Franchisee Consultants usually work with four franchisees in total and have many years of experience in our industry. Their operational knowledge is second to none. They really know our business, inside out, from the top down. The time taken to select a Registered Applicant (a franchisee in training) varies considerably. The speed of the process depends on both your availability and that of our Operations and Senior Management Team. While it's an extensive selection process, we work hard to be as transparent as possible to ensure we make the right decision for both of us. Add a minimum of 26 weeks training and handover of the restaurant and you can see why we only want to hear from people who share our passion, dedication and long-term goals. New for 2019 we've introduced an educational bursary which will be accessible to all franchisees in training. Before we accept an application, we’ll want you to understand exactly what we offer. 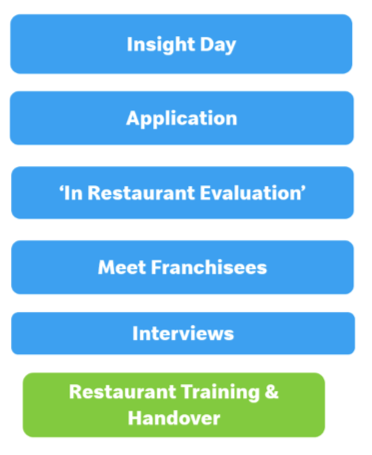 To that end, we host insight days for potential franchisees at locations all over the UK. Click on this link to register your interest. We also attend exhibitions and industry events to give you the chance to meet our people and hear about what being part of the McDonald’s story has meant to them.